What is the ISREF Function? The ISREF Function is categorized under Information functionsFunctionsList of the most important Excel functions for financial analysts. This cheat sheet covers 100s of functions that are critical to know as an Excel analyst. The function will test if a given value is a reference or not. If the given value is a reference, it will return TRUE, or else, FALSE. In financial analysisFinancial Analyst Job DescriptionSee a real Financial Analyst Job Description including all the skills, experience, and education required to be the successful candidate for the job. Perform financial forecasting, reporting, and operational metrics tracking, analyze financial data, create financial models, let’s assume we need to create 21 worksheets in a workbook. All 21 worksheets must be assigned a name. Hence, to avoid missing a sheet, we can use ISREF and keep track of them. Values (required argument) – It is the given value or expression that we wish to test. 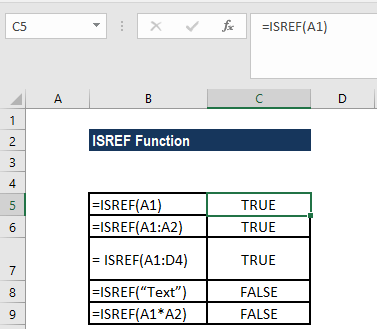 How to use the ISREF Function in Excel? 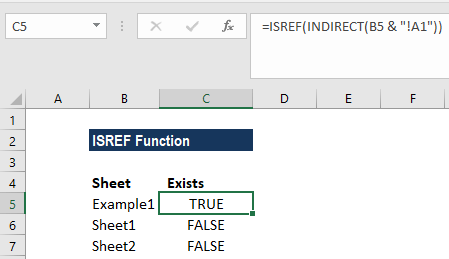 As a worksheet function, ISREF can be entered as part of a formula in a cell of a worksheet. In cell B9, we provided expression A1*A2, which would return a value that is a product of the values in two cells. Hence, in this case, the ISREF function will return FALSE. 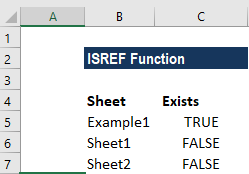 The ISREF function used here will return TRUE for a valid worksheet reference and FALSE if it is not. The formula returns the text: “Example1!A1!” The text goes into the INDIRECT function. INDIRECT then tries to evaluate the text as a reference. When INDIRECT succeeds, the reference is passed into ISREF, which returns TRUE. When INDIRECT can’t create a reference, it throws a #REF error, and ISREF returns FALSE.